Retro styling makes the UFO Spaceship inflatable ride-on float really cool with kids. It comes equipped with its own ray gun (squirt gun) which makes this ride-on out-of- this world fun. Made of heavy gauge vinyl, the UFO measures 45-in across. 140 lb weight capacity. When the summer sun is beating down, there's nothing better to cool off than floating about in a pool! Especially when you're atop this oversized inflatable pool lounger featuring a cushiony backrest, ample armrests with cup holders and handy side pockets! Removable and washable 600-denier polyester cover is UV- and rain-resistant for hours of hassle-free poolside fun. Designed for relaxation and conversation, this inflatable chaise swimming pool float can be used in and out of the pool. Kids can't resist taking a ride on this friendly Giant Sea Dragon Giant Ride-On. This eye-catching inflatable float is sure to be the hit of the neighbourhood. At over 9 ft. long, it can carry kids on great adventures. Heavy-duty vinyl construction withstands the rigors of endless hours of play. Take this inflatable glider out for a spin for hours of flying around the pool. Simply inflate the four chambers and you're ready to take to the sky. The weighted nose and a gentle toss lets this plane soar across your pool. Orville and Wilbur didn't have it this good. Kids will have a blast with this new and exciting pool toy. Constructed of heavy gauge vinyl - includes repair patch kit. 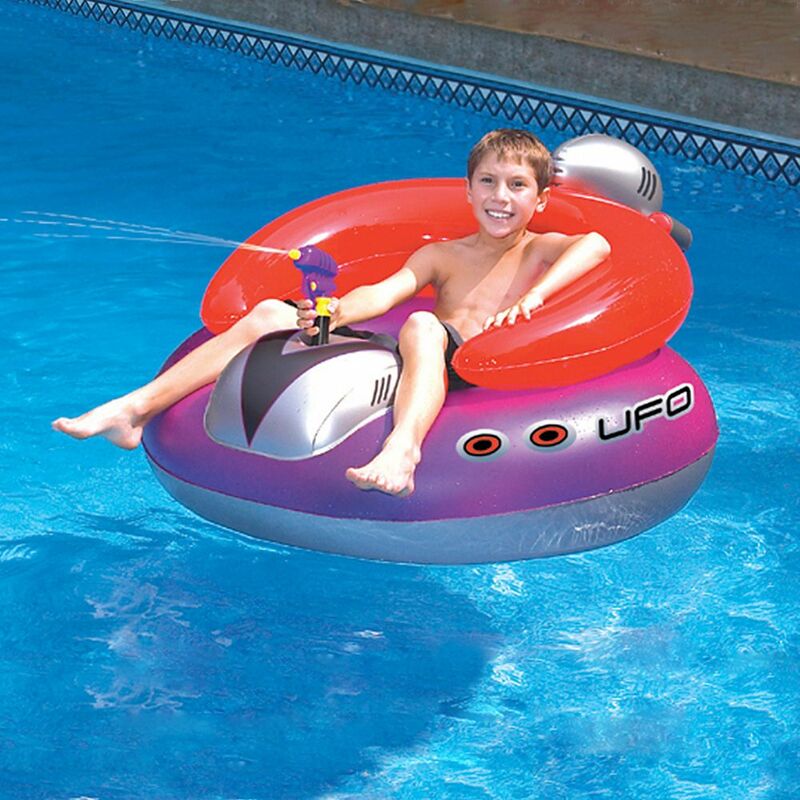 UFO Spaceship Inflatable Pool Toy Retro styling makes the UFO Spaceship inflatable ride-on float really cool with kids. It comes equipped with its own ray gun (squirt gun) which makes this ride-on out-of- this world fun. Made of heavy gauge vinyl, the UFO measures 45-in across. 140 lb weight capacity.